The Courtyard Mt. Pleasant at Central Michigan University is an ideal home base for your visit to Mt. Pleasant, MI. Located off US-127 and convenient to Kelly/Shorts stadium, as well as local corporations including American Mitsuba Corporation, Manitowoc/Delfield, Morbark, Bandit, and Unified Brands. Just minutes away from the Soaring Eagle Casino and numerous award winning golf courses. 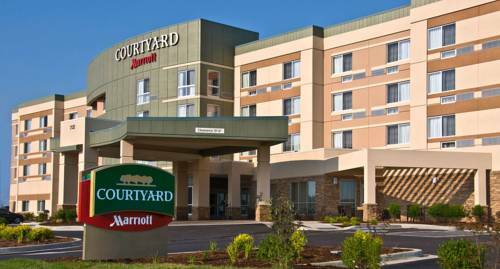 Enjoy our spacious guest rooms and suites featuring a large, well-lit work desk, flat screen HDTV and complimentary Wi-Fi. Visit our on-site fitness center, business center and enjoy a swim in our indoor pool. Start your morning with Starbucks coffee and a healthy, sensibly priced breakfast in our on-site Bistro which also serves dinner and cocktails in the evening. We invite you to utilize the interactive touch screen GoBoard for quick, easy access to news, weather, maps and directions. Whether you are visiting for business or pleasure, the Courtyard is the perfect place to relax and recharge!